As a sewing blogger I am very aware of the problems involved in fitting garments made from Big 4 pattern company patterns: Simplicity/New Look, Vogue, McCall's, and Butterick. * It's well known among us sewists (see recent posts from Shams and Robin) that if you go by your actual body measurements you will most likely end up with an oversized garment. This is because these pattern makers are notorious for ridiculous amounts of ease in their patterns. A typical sewing pattern includes both wearing and design ease. Wearing ease is minimal and exists so that one can actually sit, stretch, and move in a garment. Design ease is what makes the difference between a dress skimming the body's curves or billowing around them. Design ease is calculated by the designer/maker of the pattern to give the finished garment a specific look. However, it seems the Big 4 likes to overcompensate on the wearing ease issue. I can only guess it's to allow for more women to fit into each size? Why that is, don't ask me. Therefore, to fix the problem many sewists automatically cut a smaller size than the pattern measurements recommend. Unfortunately, that still might not guarantee a good fit. It might be better to note how each company describes the final fit of the individual garment in their pattern descriptions. These following terms correspond with their published ease charts. The charts, available in the back of Vogue Pattern magazine and on their website work for all three brands of the McCall Pattern Company; Vogue, McCall's and Butterick. They give you an idea of what to anticipate when it comes to fitting their garments. Check out the details for Butterick patterns below. Very loose fitting = 8" and more of ridiculous ease! Therefore, if you choose a Loose Fitting pattern cutting a size smaller may not make you happy. It may still be 3-4 inches larger than you would like. I also would suggest going by those ease charts and descriptions first because those pattern illustrations might not be accurate and in the photos the garments may have been altered by clothespins pulling fabric and distorting the completed garment. Update: I found a great example on Pattern Review, Vogue 1287 which is described as "very loose fitting." Read the reviews and what is the only problem most had with this pattern? The huge amount of ease. Which according to Vogue's chart would mean 8" or more. However, looking at the pattern photo, that is not what it looks like but that's what everyone expected. Therefore, to save yourself the frustration that these nine women experienced, definitely start to keep these descriptions in mind because it will help you even if you can't get to the finished garment measurements that you need. Unfortunately, this kind of detailed ease chart isn't available for the Simplicity Creative Group brands (Simplicity, New Look) but there is this helpful fitting guide** and this handout** for choosing the correct pattern size. Therefore, for these patterns you will have to consult the finished measurements on the pattern's back and on the pattern tissue. Unfortunately, some stores frown on you opening up the pattern tissue in the store before you buy! (Shocking, right?) I've many a time opened up a pattern at home and realized I should have bought another size. At least they'll do an exchange if you have a receipt but it's a pain to go back when you really wanted to start on the project right then. We may all have our specific problems (see Shams and Robin) that we wish these companies would change, style or otherwise. However, I understand that addressing all of our issues would be a huge financial and logistical undertaking for the Big 4. Perhaps, we can take it one step at a time. What if they could agree to print finished garment measurements on the outside of all pattern envelopes (as well as on the tissue)? Most patterns do print some on the envelope but for fitted dress or wardrobe patterns we need the "Big Three": bust, waist, and hip. Can we all agree on that? What do you think? *Called the Big 4 but only two actual companies, the McCall Pattern Company (Vogue, McCall's, and Butterick) and the Simplicity Creative Group (Simplicity and New Look). **Update: Simplicity has a new fitting handout available for download on their website!!! 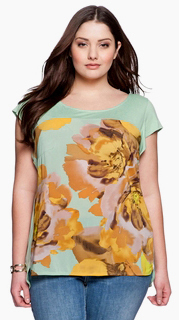 Images: Examples from Banana Republic, Eloquii (Did you know The Limited had a cool plus-size line? ), and The Gap. It would also be helpful if the pattern companies were consistent in the amount of ease from pattern to pattern. Over the weekend I tissue fit a pattern that was supposed to be a size 16. It was pretty snug and it just didn't look right...I compared it to another pattern and it was the same size as a size 12! It was a princess seamed pattern and there were no pattern measurements on the envelope or printed anywhere on the pattern...I would have had to measure out each and every size included to figure out which one to use! Wow, ok I've never encountered that! I agree that is a MAJOR problem. Did you, by chance complain to the company? That's what we need to do, tell the companies directly. I'm going to start doing that. Yes, we've spoken out on our blogs and they may become aware of it, but to be fair, that IS a passive-agressive way of dealing with the problem. What company was it? I absolutely agree. It is so frustrating trying to figure out where to find this information each and every time I use a new pattern. And often, the measurement I really need is the one that's left out! This is one thing I'm finding I appreciate on vintage patterns: much more information on the envelope back - often including images of what the pattern pieces look like, which I find very useful. Reading the finished garment measurements on the outside of the pattern or on the tissue is something I learned from reading pattern reviews. It has made all of the difference in the fit of my garments. I make sure that I choose the size with the correct amount of ease. I didn't know this was an issue because I'm a novice sewer (with a machine) and haven't tried making garments yet. But I'm definitely bookmarking your blog to read through before I attempt it. Lots of good tips here. Also, thanks for stopping by my blog! Lack of finished pattern measurements on the envelope (and sometimes they have them NOWHERE, not even on the tissue) is my major pet peeve with the Big 4. I see I am not alone! Hi! Thanks for letting me know about the links. I've fixed the ones I could, it's strange but Simplicity had the most comprehensive fitting info and removed it all from their site! I'm hoping I can find a link to the PDF somewhere and still offer it to people as it was really good. The Me-Madeness of it All!